For most Android users, motion controls are a gimmick. The only time they get used is when you’re showing your phone off to your friends. Before you enjoy these features, you need to activate motion control. To do that, go to the Settings menu and tap Controls from the top-right section of the menu bar. Then, check the slider beside Motions to ‘On’. But which motions should you actually use? Keep reading. If you’ve ever been texting someone and thought, “This would be way easier to explain if I just called”, then you’ll like the Direct Call motion control. Whenever you’re viewing a contact’s message or contact details, you can simply hold the phone up to your ear to instantly call that person. Smart Alert is a useful feature that will vibrate your phone whenever you pick it up after missing a call, text, or alert. So if you leave your phone on your desk, walk away, and get a text, then your Galaxy will vibrate when you pick it up. You can easily zoom in on an image in your Gallery by holding both your thumbs on the screen and tilting forward or backward to zoom. It’s useful when you don’t want to take one hand off your phone to do the awkward ‘pinch to zoom’ motion. After zooming in on a photo using the motion control mentioned above, you can pan around that photo by tapping and holding the screen with one finger. Just tap, hold, and continue holding as you move your finger around. 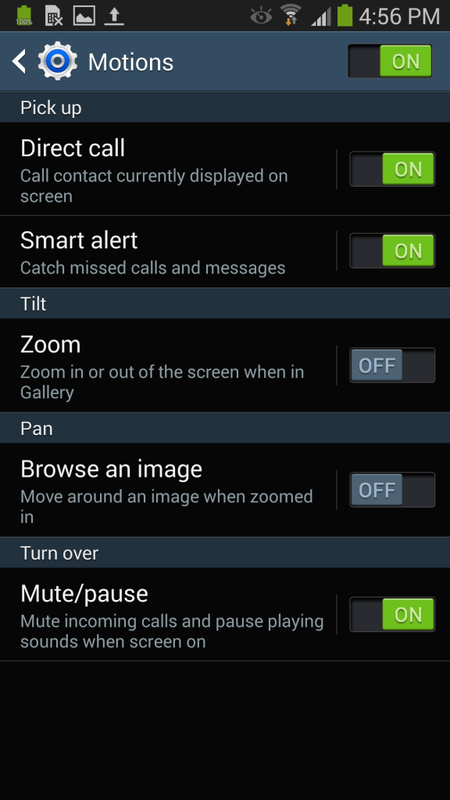 You can mute your phone and its alerts simply by flipping it over. So if you’re listening to music and somebody starts to talk to you, you can simply flip your phone over to pause the song. This also works with incoming calls, alerts, alarms, notifications, etc. You can also mute and pause songs/media by covering the screen with your hand. 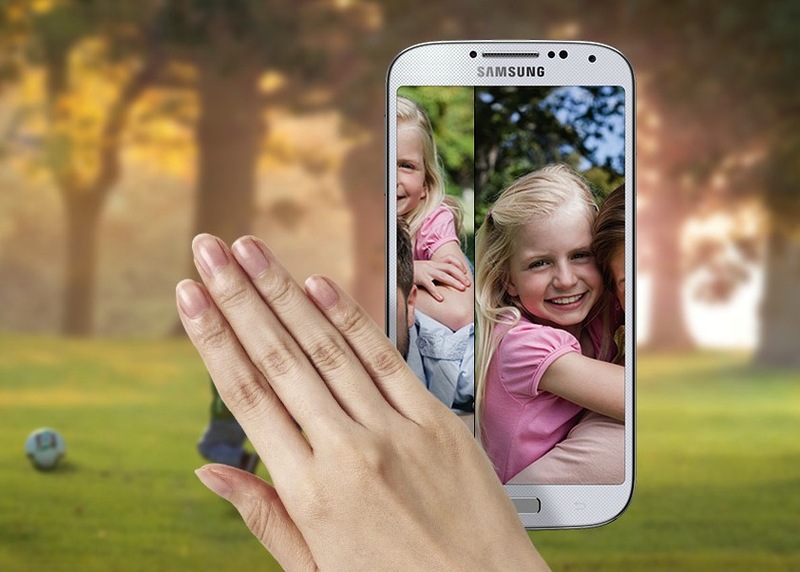 Simply place your hand over the Galaxy screen and whisper Shhhh to pause your media. Note: the last part is not required. You can take a screenshot with your Galaxy motion controls by swiping your palm right to left or left to right across your screen. This will capture an image of anything that’s on your screen. These motion controls work on all modern Galaxy devices, including the Galaxy SII, SIII, SIV, Note, Note 2, and Note 3.